THE PERFECTIONS of God are so infinite that no single creature could possibly reflect His Power and Goodness. God therefore multiplied creatures that what one failed to reveal the other might declare. The same is true of the Incarnate Son of God, Our Lord and Savior Jesus Christ. The richness of His Redemptive Blood would not be reflected in only one material way. Rather like the sun, the beauties of whose seven rays are reflected only by shining through the prism, the beauties of Calvary are only adequately revealed to us as they shine through the prism of Christ's Church and split up into the vivifying graces of the seven Sacraments. Mary, the Mother of that Divine Savior, is only a creature, human and not Divine. But exalted to the high office of being the ciborium of Emmanuel for the nine months she bore about in her virgin flesh the Host Who is the lamb of God, it follows that she has so much dignity that no one title could exhaust it. That is why there is a Litany to her made up of many titles, as so many facets reflecting the various lights of the diamond of her Divine Maternity. In like manner, the tradition of the Church is full of various titles under which the intercessory power of the Blessed Mother may be invoked. At one time, it is as the Defender of Christianity when the Turks invaded Europe; at another as the Queen of Peace; at another as the Lady of Lourdes. One of these titles and one of the most glorious of them all is: "Mary, Mother of the Scapular of Mount Carmel, or Our Lady of Mount Carmel." Since we learn to love ends because we know their beginnings, so we are strengthened in our love of the Blessed Mother by being shown the foundation stones upon which it reposes. More than that, one sees in the scapular, which is a miniature clothing, a reversal of the penalties and effects of Original Sin. Before Adam sinned, he was naked but not ashamed. That was because of the integrity of his human nature by which senses were subject to reason and reason to God. His union with God was, as it were, the clothing of his whole being. But once that union was disrupted, he was naked and ashamed. He now had need of clothing. From that day to this, human nature has used either one of two kinds of clothing, depending upon whether they emphasized the nakedness of souls or the nakedness of the body. Those who are totally disinterested in God clothe themselves with jewels and finery to compensate, whether they know it or not, for their inner spiritual poverty. Those who love God, and therefore have souls clothed with the raiments of His grace, need never care about the richness of the external. We see something of the symbolism of this in the clothing of a nun. When the ceremony begins she is dressed in surpassing beauty and bedecked with jewels. But once she consecrates herself to God she clothes herself in the poverty-stricken garments of her community. Being clothed with the richness of Divinity, why should she concern herself with the superficial beauty of the world? There must be something of this symbolism in Mary's gift of the scapular which was originally a habit. "The beauty of the King's daughter is from within." Mary's gift of clothing is just a simple garment, sufficient to cover the traces of Original Sin in us, but its very simplicity is also a witness to the fact that her own beautiful mantle covers our souls. 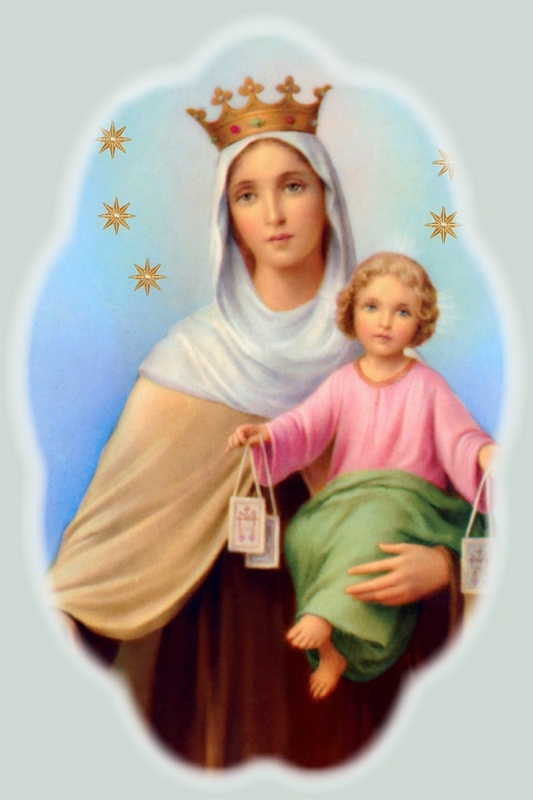 The scapular bears therefore a double witness: to Mary's protection against the ravages of the flesh occasioned by the Fall, and to Mary's influence as Mediatrix of graces, who covers our souls with the richness of her Son's Redemption. Mary has been constituted by her Divine Son as the intermediary between our needs and His wants; such was the role she played at the marriage feast of Cana, when she interceded for the needy guests to the miraculous power of Her Divine Son. It is a singular fact that in answer to her request Our Lord addressed her, not as 'Mother', but as 'Woman', as if to imply that once she began interceding for the humanity whom He was to redeem when "the hour" would come, she entered into a larger relationship than merely that of being His Mother, namely, that of 'Woman', the new Mother of redeemed men. On the Cross this title is conferred again when Our Lord addresses her as "Woman! Behold thy son!". She had brought forth her "first born" in the flesh at Bethlehem, now she was to bring forth her first born in the spirit at Calvary, namely John, the beloved disciple. John was the symbol of men, whose motherhood Mary purchased at the foot of the Cross in union with her Divine Son. It is not by a figure of speech, nor by a metaphor that Mary is our Mother, but rather by virtue of the pangs of childbirth. As a woman can never forget the child of her womb, so neither can Mary forget us . . .
with Nihil Obstat and Imprimatur.